Everyone wants to get rid of whiteheads and blackheads. Can whiteheads or blackheads be removed safely? Acne is a common skin condition affecting as many as 80% of all teenagers and 25 to 50% of adults, depending on gender. Acne is caused when pores are filled with too much "sebum" (skin oil) and dead skin cells. These oils and cells clog the pores and allow an otherwise harmless bacteria to reproduce with more frequency. These clogged pores and bacteria lead to inflammation, and inflammation is what causes the visual appearance of acne. There are a few different types of acne but most people are familiar with two of the most common types: whiteheads and blackheads. Whiteheads – Whiteheads are closed pores. They're generally blocked with skin oils which give them the white color. Closed or near closed pores nearly always become whiteheads. Blackheads – Blackheads occur when the pore is full of sebum and cells but isn't able to close. These open pores experience a reaction that causes melanin to turn them the dark color. Both whiteheads and blackheads can affect your appearance, which is why most people seek treatment options to get rid of whiteheads and blackheads. The best way to get rid of blackheads and whiteheads is with prevention. General Face Washing – Washing your face regularly twice a day with a cleanser (or acne cleanser) is an important way to get rid of whiteheads and blackheads. It's not effective against hormonal overproduction of acne, and may not prevent all acne breakouts, but good hygiene is still a useful tool for getting rid of acne. Oral Antibiotics – Antibiotics are an effective treatment option. Antibiotics are a prescription medication that eliminates and control bacteria, ultimately leading to less inflammation and ultimately less acne. Antibiotics do come with risk, and the skin can become immune to antibiotic treatments, but they're one of the most common ways that men and women treat acne. Topical Antibiotics – Topical antibiotics tend to have fewer side effects than oral antibiotics but tend to fight inflammation rather than reduce overall bacteria. Topical antibiotics come in creams and gels and may be mixed with other acne treatments. These are also available by prescription only. Benzoyl Peroxide – Benzoyl Peroxide is a compound that commonly comes in gel form that clears pores and reduces bacterial count. It's one of the more effective acne treatments, but can cause skin dryness and irritation, with a risk of swelling, itching, and other unwanted skin issues. Benzoyl peroxide is often combined with antibiotic treatments to improve efficacy. Salicylic Acid Lotions – Salicylic acid is another type of acne compound that may be used to treat acne. It is available without a prescription and generally believed to reduce inflammation and possibly cleanse some bacteria. These lotions are readably available and well regarded in the acne community. Natural Lotions – For those that prefer not to use medicated lotion, there are lotions with herbal and mineral ingredients that may be worthwhile as well. There is little research supporting many of these natural lotions, but anecdotally there are several that many claims have skin health benefits. Nutrition – While science has generally disagreed with the notion that nutrition has much of an effect on acne buildup, there is some evidence that your diet can affect acne. Foods that are high on the glycemic index may contribute to acne, as could milk. In addition, generally eating a healthy diet may have benefits for your hormones and skin health. Supplements – There are also oral supplements available to help augment your diet in order to get rid of blackheads and whiteheads. Some are herbal, while others are vitamin supplements that provide important nutrients for maintaining skin health. The more you take care of your skin health, the fewer whiteheads and blackheads your skin will have. That is why acne treatments are important so that you have less acne to remove. Many people try to get rid of whiteheads (and to a lesser extent blackheads) by popping them with their fingers. Scarring – Easily the biggest issue with popping acne is that it causes scarring. Many people suffering from acne create so many scars that it appears they still have acne even when they do not. Creating an open wound by popping acne is simply a bad idea in the long-term prevention of acne. 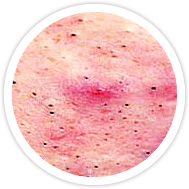 Inflammation – Popping your acne also causes a reaction that causes more inflammation in and around your pimple, due to the pain and pressure placed on the acne in order to get it to pop. While your acne may shrink slightly, it will actually be redder and more visible than if you had left it as a whitehead or blackhead. More Acne – In addition, deep within the acne is bacteria that causes the acne breakout. When you pop your whiteheads, you are actually spreading the bacteria. This can cause you to get more acne in the future because it spreads the infection, no matter how well you clean up afterward. Cysts – Finally, when you pop your acne you create the potential to create a cyst, which can be incredibly painful and develop deep within the skin. It's common to think that you're curing the acne by popping it, but all you're doing is temporarily draining some of the pus deep inside. You're also releasing more bacteria, creating a red mark and potentially permanent looking acne scar, and putting yourself at risk for more painful lesions. Many people believe there are home remedies that will help them get rid of whiteheads. For example, many people believe that toothpaste is effective at removing whiteheads. While there is little scientific reason to believe that toothpaste work, most people report that as long as you choose a basic, mint paste toothpaste, it does appear to help them remove pimples. Those with sensitive skin, however, may find that their skin is left too red after using toothpaste as an acne treatment. Beyond that, there are very few safe ways to get rid of blackheads and whiteheads other than letting them come out naturally. Always wash your face and hands thoroughly. Warm your face first with a warm washcloth for an extended period of time (you can also steam your face with a very hot shower). Use some type of safe, sterilized tool to remove the blackhead (or whitehead). If it hurts, do not remove it, as it is probably not ready to come out. Disinfect the area with an antibacterial cleanser and wash your face and hands again. Never use your hands to pop them or try to pop them using pressure on the outside of the acne, as this will only irritate the skin. Do not try to remove any whiteheads that cause a great deal of pain during removal. It's not advised to pop any acne for the reasons described above, but with enough steam/heat/water and a good tool, you can get rid of some acne a little bit safer than the traditional method of popping with your fingers. Otherwise, once the blackheads and whiteheads appear, there is little opportunity to remove them safely. The key is consistent prevention. Using the right acne treatments, you can prevent both blackheads and whiteheads, and decrease the need to remove them.